Did you know inefficient working practices can cause your organization to waste up to 45 working days every year? Making sense of the chaos can make you feel overwhelmed, especially if you’re expected to oversee a plan, organize a team, delegate tasks and track progress- when no one taught you how! 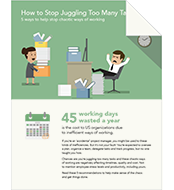 Download these tips to learn how to stop the chaos and start getting work done.